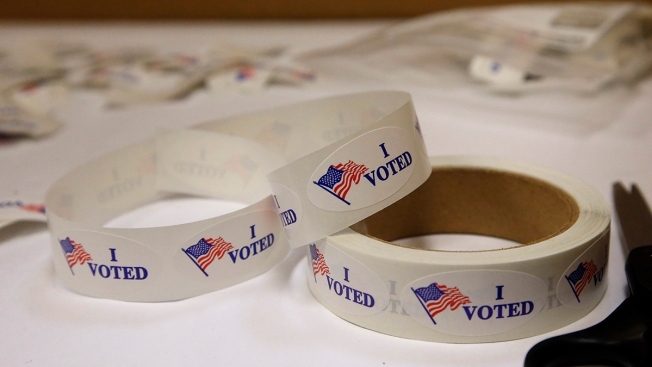 In this June 21, 2018, file photo, "I Voted" stickers are seen in Oklahoma City. Civil rights groups sued Georgia Secretary of State Brian Kemp, the Republican candidate for governor who also oversees elections in the state, saying the method his office uses to verify new voter registrations is discriminatory, NBC News reported. The lawsuit, filed late Thursday in the U.S. District Court in Atlanta, comes after the revelation that thousands of applications remain in a pending status just weeks ahead of November's midterm election. The filing alleges that Georgia's "exact match" protocol — which requires information on voter registration applications to precisely match information on file with the state's Department of Motor Vehicles or the Social Security Administration or be placed on hold — suppresses minority votes in violation of the Voting Rights Act, the 14th Amendment and the 1993 Voter Registration Act. "Under this 'exact match' protocol, the transposition of a single letter or number, deletion or addition of a hyphen or apostrophe, the accidental entry of an extra character or space, and the use of a familiar name like 'Tom' instead of ‘Thomas’ will cause a no match result," lawyers for the civil rights groups wrote in the suit.